From the outside, the cafe is quite deceiving. Set in a terrace building a few doors down from the Mercantile Hotel and next door to the highly acclaimed super fresh scone providing ‘The Tea Cosy’, Swagman’s Courtyard Cafe sounds very touristy. But why wouldn’t it? It is however smack bang in the middle of Sydney’s historical Rocks area. Unless you want to people watch, forget the tables on the footpath and head straight to the large shady courtyard out the back. I would like to say ‘give this place a go for scones’, but with ‘The Tea Cosy’ next door – why would you stop? 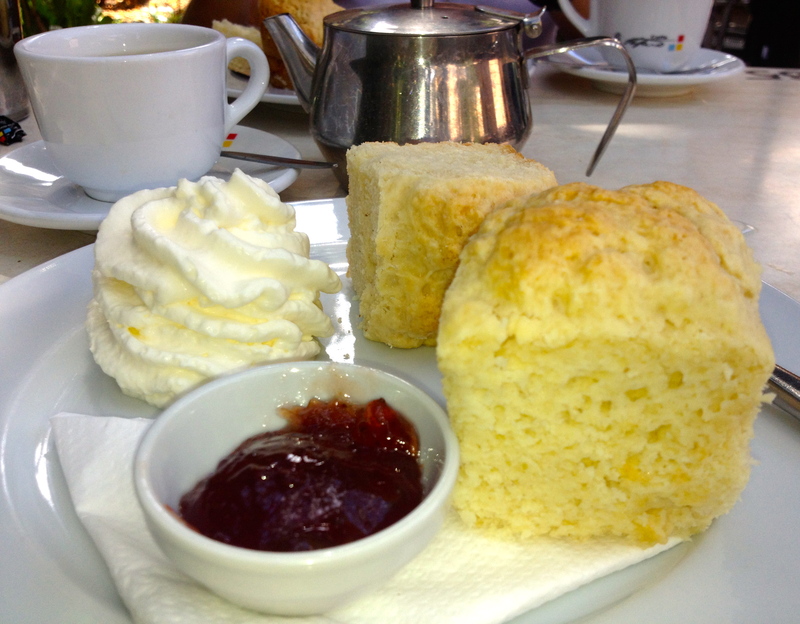 The scones are bread-like and slightly sweet, and too dry to be enjoyable. The jam is cheap and not particularly cheerful and the cream light and airy. My companion, so used to her mother’s country-style scones, gives it the thumbs down. What a shame, the courtyard and friendly staff are a real gem. Tea: Seven choices of ‘tea drop’ pyramid bag loose-leaf teas served in a small pot. Overall: The tranquil courtyard is a great escape from the weekend crowds.